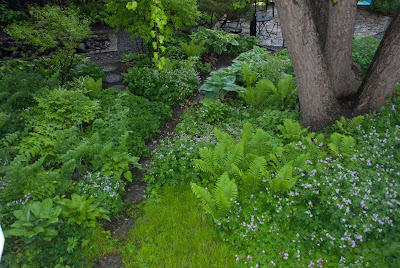 In 2003, Marty Rice, one of the founders of Wild Ones Twin Cities Chapter hired Eric Olson of Outback Nursery to design and assist her in the conversion of her backyard into a native garden. 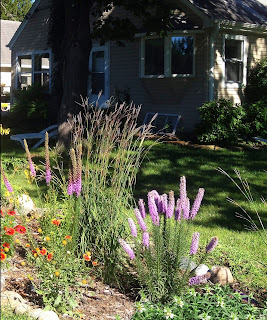 In December 2007 Marty and her husband Jeff sold their home to Jeremy and Amy-Ann Mayberg. 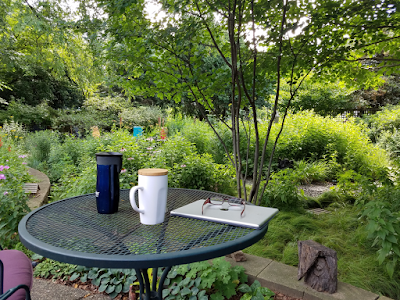 Concerned the new owners might plow the garden down and replant a lawn, she and Jeff called upon the new owners the day they moved in, and over coffee and muffins she told them of Wild Ones and the garden of native plants out back. 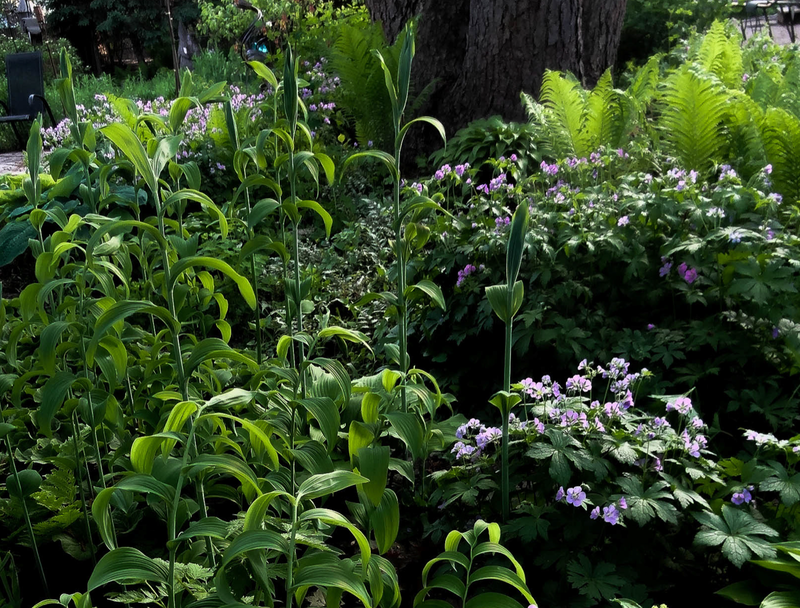 She urged them to experience one growing season before doing anything in the garden. 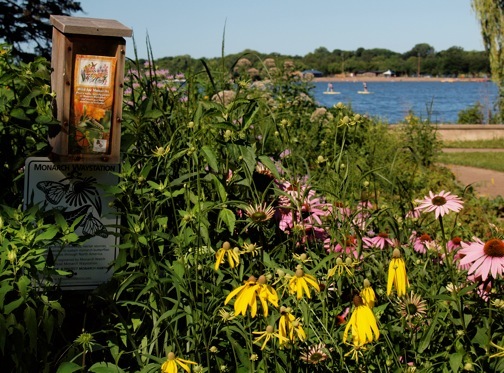 Marty’s passion for native plants was infectious, Jeremy caught the bug and has been the steward of this magnificent urban oasis for the last eleven years. 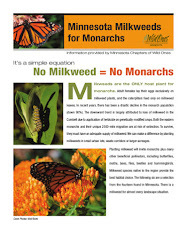 He now sits on the Board of Wild Ones Twin Cities and is the Program Chair of this year’s Design with Nature Conference. The garden has been featured in Lynn Steiner’s Prairie Style Gardens, Evelyn Hadden’s Beautiful No Mow Lawns and was featured as one of the 2017 Twin Cities Best Gardens by the Minneapolis Star Tribune. 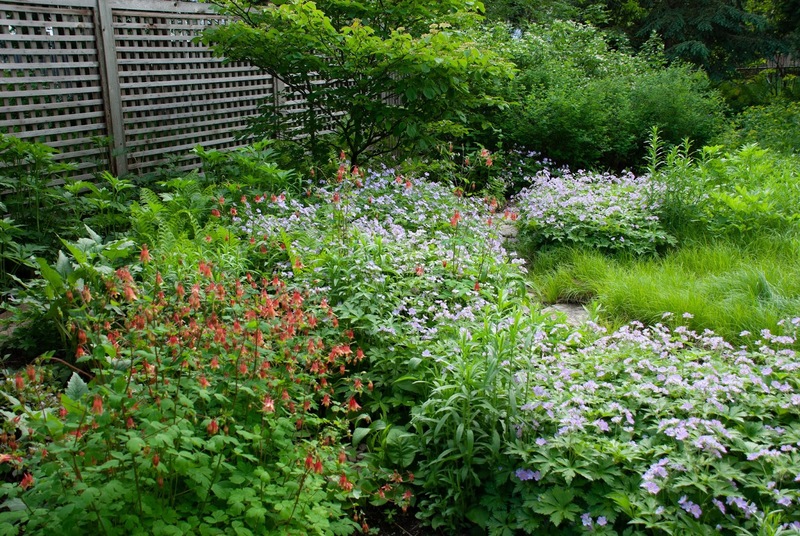 A retired architect and accomplished photographer, Jeremy will present his approach to creating an urban oasis through landscaping gardening with native plants. When Andy and his partner purchased their home, the yard was a barren plot of struggling exotic shrubs, patchy turf grass, and not much else. 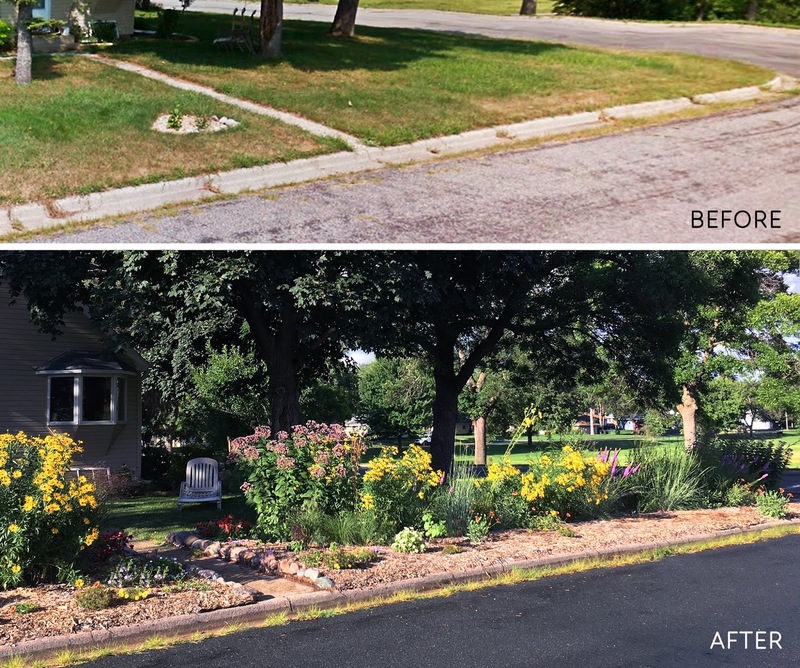 Fast forward 7 years and the 1/4 acre yard in Bloomington, MN is now home to numerous species of native woodland and prairie plants. His gardens are strictly composed of only plants native to North America, including 6 species of Milkweed. 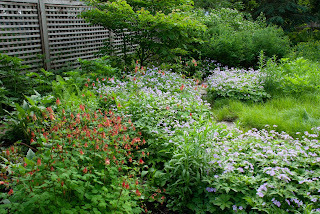 Different approaches were utilized to create the new garden beds, but sheet mulching (the technique of smothering turf grass with a thick material like cardboard) worked quickly and efficiently to establish new beds and start the process of cultivating healthy soil. 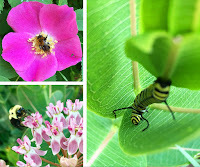 These new habitat gardens contain host plants for valuable insect life (including numerous Monarch larva each year), and food and cover for birds. Andy will showcase before and after images and explain the process of converting lawn-to-garden that illustrates anyone can do it. Also include the source of you native seed if known. Thank you! 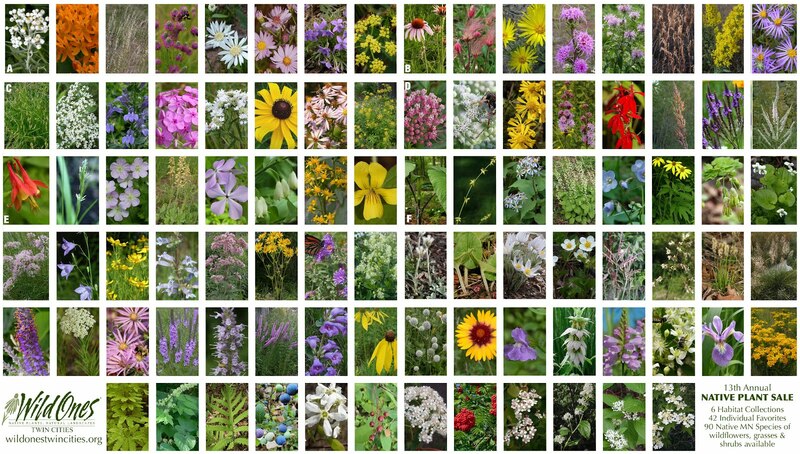 Click here for a printable pdf on Native Plant Seed Collection. 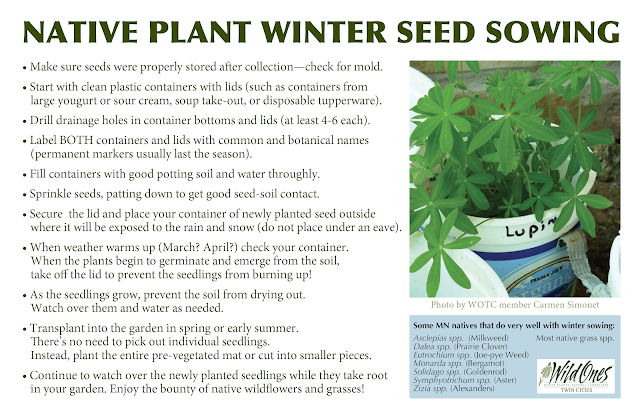 Click here for a printable pdf on Native Plant Winter Seed Sowing. 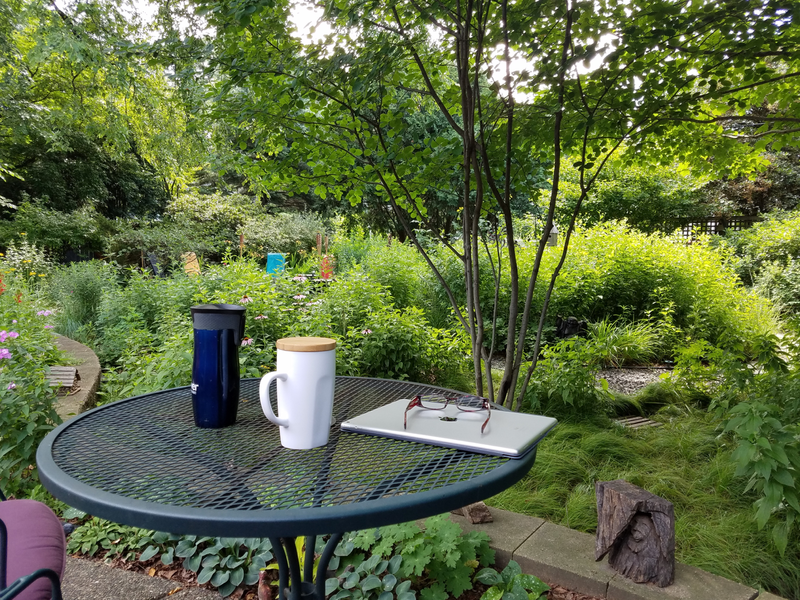 Wild Ones Twin Cities Quarterly Board Meetings! Come take part in shaping your chapter! 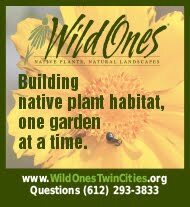 Wild Ones is a non-profit, volunteer organization, and there are many participation and leadership opportunities. 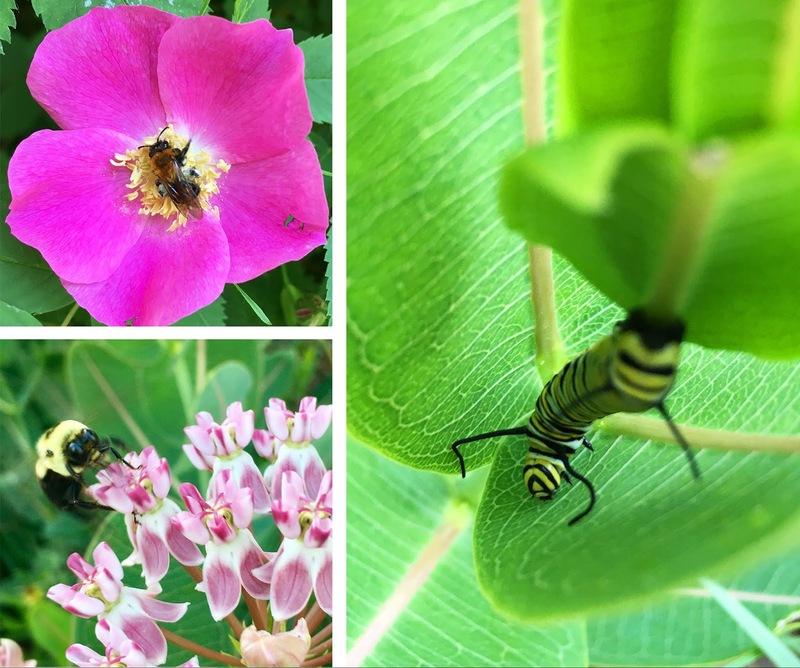 Please consider sharing your time, expertise and enthusiasm in furthering our mission of building native plant habitat, one garden at a time! EARLY-BIRD REGISTRATION CLOSES on JANUARY 19th! Conference Registration closes February 2nd.